United States Army Secretary Mark Esper recently revealed that the military has a strategic vision of utilizing autonomous and semi-autonomous unmanned vehicles on the battlefield by 2028. “I think robotics has the potential of fundamentally changing the character of warfare. And I think whoever gets there first will have a unique advantage on the modern battlefield,” Esper said during a Brookings Institution event. The Army of 2028 will be able to deploy, fight, and win decisively against any adversary, anytime, and anywhere … through the employment of modern manned and unmanned ground combat systems aircraft, sustainment systems and weapons. When Esper was reportedly asked about concerns regarding autonomous robots being a threat to humanity, he replied in jest, “Well, we’re not doing a T-3000 yet,” referencing the Terminator movie series about self-aware AI threatening the existence of humanity. “I think the danger of AI is much bigger than the danger of nuclear warheads by a lot. Nobody would suggest we allow the world to just build nuclear warheads if they want, that would be insane. And mark my words: AI is far more dangerous than nukes,” Musk added. 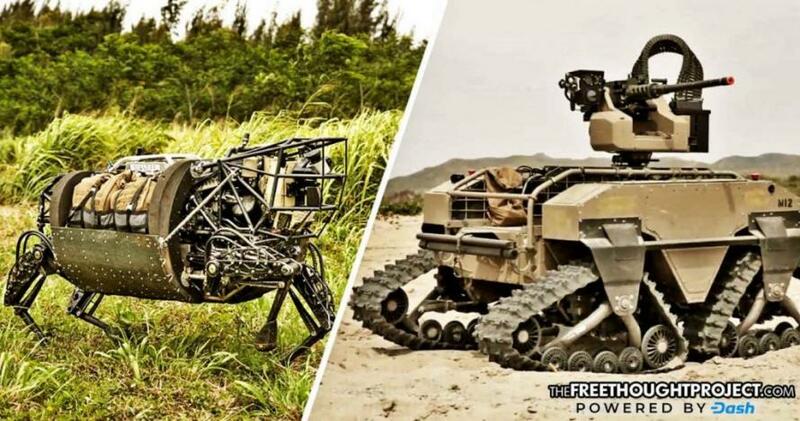 As The Free Thought Project reported last month, the Pentagon reportedly plans to spend more than $1 billion over the next few years developing advanced robots for military applications that are expected to complement soldiers on the battlefield, and potentially even replace some of them. Esper attempted to allay fears by noting that the Army’s unmanned vehicle program would be akin to the Air Force’s use of Predator drones, and clarified that the idea would be to protect soldiers by removing them from direct combat. In turn, he said, this would enhance tactical ability and mobility, thus paving the way for cheaper tanks due to not having a crew inside in need of protection. However, due to the complexity of the modern battlefield, a human element would remain part of the process. “In my vision, at least, there will be a soldier in the loop. There needs to be. The battlefield is too complex as is,” Esper said. During his SXSW commentary, Musk noted that rapid advancements in artificial intelligence are far outpacing regulation of the burgeoning technology, thus creating a dangerous paradigm. He explained that while he is usually against governmental regulation and oversight, the potentially catastrophic implications for humanity create a need for regulation. The billionaire inventor pointed to Google’s AlphaGo, an AI-powered software that can play the ancient Chinese board game Go as evidence of exponential learning capacity of machines. Although it was reputedly the world’s most demanding strategy game, in early 2017, the AlphaGo AI clinched a decisive victory over the top Go player in the world. While current semi-autonomous systems keep humans marginally in the loop, the advent of fully autonomous systems that operate without any human input creates serious ethical implications in terms of the morality of using killer robots to slaughter human combatants on the battlefield. We are clearly on an extremely slippery slope when it comes to killer robots and A.I. Intellectual giants like Elon Musk and Stephen Hawking have continually attempted to sound the civilizational alarm regarding the extreme dangers inherent to AI. As an article in the Guardian on Monday pointed out, killer robots are only a threat if we are stupid enough to create them. Now, the only question is: Will anyone heed all these warnings?